[S26] 1900 United States Federal Census, online , Year: 1900; Census Place: Conquest, Cayuga, New York; Roll: T623_1012; Page: 2A; Enumeration District: 26; FHL microfilm: 1241012. [S11] 1910 United States Federal Census, online , Year: 1910; Census Place: Montezuma, Cayuga, New York; Roll: T624_928; Page: 3B; Enumeration District: 0049; Image: 812; FHL microfilm: 1374941. [S69] 1940 United States Federal Census, online , Year: 1940; Census Place: Montezuma, Cayuga, New York; Roll: T627_2508; Page: 7A; Enumeration District: 6-57. [S2] 1880 United States Federal Census, online , Year: 1880; Census Place: Butler, Wayne, New York; Roll: 943; Family History Film: 1254943; Page: 73B; Enumeration District: 173; Image: 0338. [S75] Ancestry.com, World War I Draft Registration Cards, 1917-1918 (n.p. : Online publication - Provo, UT, USA: Ancestry.com Operations Inc, 2005.Original data - United States, Selective Service System. World War I Selective Service System Draft Registration Cards, 1917-1918. 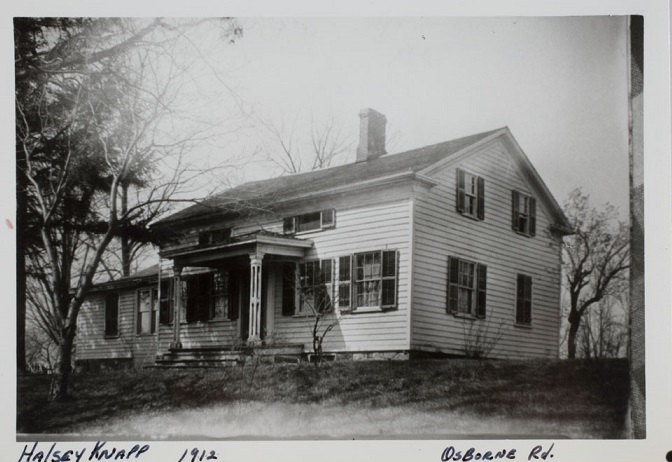 Washington, D.C.: National Archives and Records Admini, unknown publish date), Registration Location: Schoharie County, New York; Roll: ; Draft Board: . [S65] 1920 United States Federal Census, online , Year: 1920; Census Place: Cobleskill, Schoharie, New York; Roll: T625_1264; Page: 12B; Enumeration District: 82; Image: 122. [S69] 1940 United States Federal Census, online , Year: 1940; Census Place: Throop, Cayuga, New York; Roll: T627_2508; Page: 1A; Enumeration District: 6-79. [S1] 1870 United States Federal Census, online , Year: 1870; Census Place: Butler, Wayne, New York; Roll: M593_1112; Page: 69B; Image: 145; Family History Library Film: 552611. [S9] Ancestry.com, 1860 United States Federal Census (n.p. : Online publication - Provo, UT, USA: Ancestry.com Operations, Inc., 2009. Images reproduced by FamilySearch.Original data - 1860 U.S. census, population schedule. NARA microfilm publication M653, 1,438 rolls. Washington, D.C.: National Archives and Records, unknown publish date), Year: 1860; Census Place: Savannah, Wayne, New York; Roll: M653_876; Page: 125; Image: 126; Family History Library Film: 803876. [S26] 1900 United States Federal Census, online , Year: 1900; Census Place: Aurelius, Cayuga, New York; Roll: T623_1012; Page: 9B; Enumeration District: 22; FHL microfilm: 1241012. Her married name was Chappel. Jennie Buckland was born on 15 October 1851 at Brutus, Cayuga, New York, USA.1,2 She married Russell S Chappel, son of Thaddeus Crippen Chappell and Catherine E Martin, in 1876.1 Jennie Buckland lived in 1880 at Aurelius, Cayuga, New York, USA.2 She lived in 1900 at Cayuga, Cayuga, New York, USA.1 She died on 16 July 1921 at Aurelius, Cayuga, New York, USA, at age 69. [S2] 1880 United States Federal Census, online , Year: 1880; Census Place: Aurelius, Cayuga, New York; Roll: 813; Family History Film: 1254813; Page: 424C; Enumeration District: 013; Image: 0616. [S85] Montezuma Birth Records, online <http://web.archive.org/web/20001110085900/http://…>, Carl, Rena May (f) May 5, 1885 one stillborn Montezuma Sophara Hamilton (19) Waterloo NY Elsworth Carl (24) Laborer Montezuma. [S44] Town of Montezuma Records, online http://web.archive.org/web/20020215005729/http://…, (Waybackmachine), Carbery, Patrick Sep 30, 1887 70 Ireland Thomas Carbery Alice Carbery. [S44] Town of Montezuma Records, online http://web.archive.org/web/20020215005729/http://…, (Waybackmachine), Carbery, Mary June 30, 1897 86-0-12 Ireland Moroney Moroney. Benjamin J S Buckland married Celestia A Coman. [S2] 1880 United States Federal Census, online , Year: 1880; Census Place: Montezuma, Cayuga, New York; Roll: 814; Family History Film: 1254814; Page: 183D; Enumeration District: 029; Image: 0289. [S2] 1880 United States Federal Census, online , Year: 1880; Census Place: Cayuga, Cayuga, New York; Roll: 813; Family History Film: 1254813; Page: 429B; Enumeration District: 013; Image: 0627. [S26] 1900 United States Federal Census, online , Year: 1900; Census Place: Montezuma, Cayuga, New York; Roll: T623_1013; Page: 8B; Enumeration District: 34; FHL microfilm: 1241013. [S68] 1915 New York, State Census, online , New York State Archives; Albany, New York; State Population Census Schedules, 1915; Election District: 01; Assembly District: 01; City: Mentz; County: Cayuga; Page: 24.